What is a pastured animal anyway? There is no government definition for a pastured animal the way there is for “certified organic” or “free range”. Government certifications for farming practices are helpful when selling animals and produce to far flung markets. Generally, selling to consumers far away guarantees that the farmer has reached an industrial size which does not allow for animals to exhibit their inner instincts. Chickens want to act like chickens, which in this case involves pecking, scratching, flappingtheir wings and searching for food and the occasional dust bath. Pigs have their own wants and needs that involve digging in the dirt, wallowing in the mud, nestling in some hay and snoodling about for things to snoodle. I could go on, but the commonalities should start to become apparent – pastured animals have access to all the nutrition, interest and cleanliness of fresh grass on a daily basis. Access to fresh grass is good for the soil as well – a pastured animal’s droppings don’t have an intense smell because there is sufficient carbon in the grass and soil to absorb animal wastes for a day. The nitrogen, phosphorus and potassium from their droppings stimulate the grass to grow greener and healthier. Additionally, when grass tops are clipped back by the intense disturbance of chicken, pig, turkey, duck or goose traffic the root system dies back as well, feeding the soil web. This soil web is how carbon is stored and the pulsing action of intense animal activity for a short period of time is the best way to maximize carbon storage. Finally, pasturing animals brings benefits in terms of flavor. Our chickens taste more “chicken-y”, the fat on our pork chops is sweet from greens and our turkeys stay moist when cooked due to exercise and micronutrients from day ranging. Chefs across the island choose our meats over their industrial counterparts because there is no comparison in flavor. We use move-able bottomless pens to house our broiler chickens popularized by Joel Salatin’s Polyface Farm. We move the chickens at least once per day onto fresh pasture which keeps the chickens busy chomping away at bugs, grass and their organic grain ration. These birds lack the life experience to protect themselves from hawks, raccoons, stray dogs or the passing rainstorm so move-able pens seem like a nice compromise. When we move the pens the chickens get to stretch their legs and explore the world for a bit as you can see in the following picture. 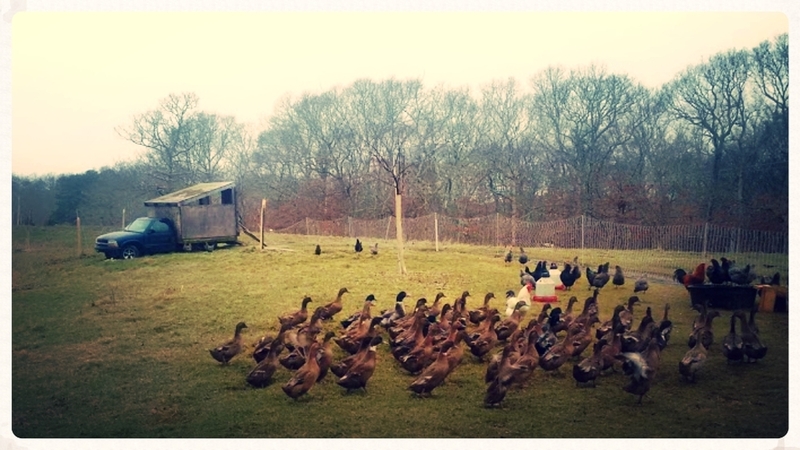 Our ducky eggers have access to the farm, almost every bit of it. They have access to a coop but can roam the property all day. In the morning we give them a small grain ration and they spend the rest of each day cleaning up after the broilers, pigs and humans of the property, keep our grass trimmed and tick load low. These birds are disallowed from the vegetable gardens, buildings and vehicles but otherwise have their run of the place. They are easy to keep track of with their raucous, booming quacks. Our hogs are principally fenced in using electric fence lines which allow us to move them around the property. Our mix of heritage breeds thrive on a diet high in vegetables and grasses. We try to give them a diversity of experiences from forested brush to grassy pasture. This allows them a varied diet of grasses, forbs (leafy greens), roots and acorns. In the winter we supplement their grain ration with abundant hay which keeps their noses busy and increases the soil fertility. We finish our hogs on sprouted grain which helps to sweeten their fat and increase intramuscular marbling. Our broad breasted white turkeys are raised using a rotational grazing system. Electric netting keeps them in a selected area until they have sufficiently grazed down the grass. The amount of time they spend in any one area varies as they grow. When they are first released into the field they are moved once every 5 days and by the week before Thanksgiving we move them once a day to get them as much grass as possible. We ensure they have shelter from the elements through a variety of protective systems and give them access to clean water and feed throughout their time in the field. Turkeys love grass and will eat as much as they can get their beaks on!